The Galapagos is a special edition of the Aquatimer diving watch series from IWC. This black timepiece commemorates the partnership between the Swiss watch manufacturer and the Charles Darwin Foundation. Aquatimer Chronograph Edition Galapagos Islands is the full name of this impressive watch. The watch's connection to the archipelago in the Pacific Ocean arose through the Charles Darwin Foundation. The foundation is based on Santa Cruz Island and has been researching the unique flora and fauna of the Galapagos Islands since 1959. IWC, a leading Swiss watch manufacturer, is one of the foundation's sponsors. 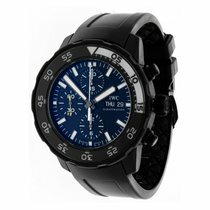 The first thing that catches your eye is the striking black color of the Aquatimer Galapagos. Its case, dial, and rubber strap are all pitch black. The hands and the writing on the dial, on the other hand, are white. This creates a stark contrast that helps you read the watch more easily. Furthermore, the black resembles the color of the island's volcanic rocks. The writing on the dial is even easier to read thanks to the luminous material Superluminova. The normal time is illuminated in blue while the dive time is in green. The Aquatimer Chronograph Edition Galapagos Islands's reference number is 3795. Its case is made of steel and gets its color via a matte black rubber coating. It has a diameter of 44 mm and a thickness of 17 mm. It's waterproof to 300 m (30 bar) and has a screw-down crown to help prevent water getting into the case. There's no doubt about it: This is a high-quality dive watch. However, this watch isn't restricted to use in the water. On land, you can also use it as a stopwatch. The watch is designed as a chronograph so it has a central stopwatch seconds hand with a flyback function. The 60-minute counter is beneath 12 o'clock and a small seconds is above six o'clock. The small seconds hand can be stopped in order to synchronize the watch to the exact time. A special feature of this Aquatimer is how you can set and read your dive time: You use an internal rotating bezel. Most other diving watches rely on an external bezel like the one on the Rolex Submariner. In combination with the minute hand, you can use the interal bezel to time periods up to one hour. There's also an additional external bezel which functions like a normal bezel. It can be rotated in both directions, but the internal bezel only turns when you turn the external bezel counterclockwise. You can thus only shorten your dive time and never accidentally lengthen it. This is a required security feature of diving watches that fulfill international standards. IWC calls this feature their SafeDive system. Older versions of the Aquatimer Galapagos have the reference number 376705. The 3767 Aquatimer premiered in 2009 and has a standard bezel for reading the dive time. The first 15 minutes on the bezel of the 376705 model are against a white background, while the rest of the bezel is black. Furthermore, there are three subdials instead of two: one for the minute counter at 12 o'clock, one for the hour counter at six o'clock, and one for the small seconds at nine o'clock. There's also a date display at three o'clock. This layout is typical of the Valjoux 7750 movement, which powers countless chronographs. It's also the base caliber for this version of the Aquatimer. You should note that this version of the Aquatimer is not as waterproof as its successor: It is only waterproof to 120 meters, or 12 bar. 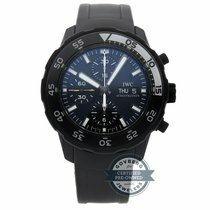 Which Aquatimer should I buy? If you're looking for a unique diving watch that doesn't have Hublot's extravagant porthole design, then you should consider the Aquatimer Galapagos Islands. Above all, the new 3795 stands out with its matte black design and SafeDive system. The timepiece is priced similar to a steel Rolex Submariner, which starts at 7,000 euros for a new watch. Though some new Aquatimers cost over 8,000 euros. The earlier version with reference number 376705 is less expensive. Most watches in this series are offered in very good condition for around 4,000 euros. New 376705 watches are less common than pre-owned ones, of course. Thus, new timepieces are somewhat more expensive and cost around 5,000 euros. Both versions of the Aquatimer Galapagos are appealing dive watches. However, the external/internal rotating bezel is only available with the newer version. It is also more waterproof than its predecessor. If you want to wear your watch while swimming and diving, then you should ensure that any pre-owned watch you're considering buying has had its waterproofness recently inspected. Having it checked within the last year is a good guideline to follow. Some dealers will tell you upon purchase when the watch's waterproofness was last inspected. The current Aquatimer Galapagos Islands is powered by the in-house caliber 89365. The mechanical automatic movement has a 68-hour power reserve, much higher than average. Normally, automatic movements can run for 40 hours before they need to be wound again. The dial is protected by double-sided anti-reflective sapphire glass, which increases the watch's legibility by preventing glare. IWC also uses the caliber 89365 in one of their pilot's watches, the Spitfire chronograph. The movement belongs to the 89000-caliber family, vibrates at 28,800 alternations per hour (4 Hz), and has 35 jewel bearings. The date display can be easily and quickly reset at the end of months with less than 31 days. The Aquatimer Galapagos Islands' case back gives the watch a special charm. It features an engraving of a marine iguana. This type of iguana is only found on the Galapagos Islands and has been categorized as vulnerable on the IUCN Red List. Another selling point of the IWC Aquatimer is its exchangeable strap. You can switch between different straps without requiring any tools. One day, you could wear a rubber strap and the next switch to a stainless steel bracelet. IWC has patented their bracelet quick-change system. Changing the strap is possible in eight simple steps, including a final fit check, and takes less than one minute.